1981 Microsoft buys the rights for QDOS from Seattle Computer Products (SCP) for $25,000 on July 27, 1981. 1981 MS-DOS 1.0 was released August, 1981. 1982 MS-DOS 1.25 was released August, 1982. 1983 MS-DOS 2.0 was released March, 1983. 1986 MS-DOS 3.2 was released April, 1986. 1987 MS-DOS 3.3 was released April, 1987. 1988 MS-DOS 4.0 was released July, 1988. 1988 MS-DOS 4.01 was released November, 1988. 1991 MS-DOS 5.0 was released June, 1991. 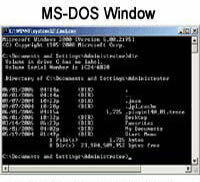 1993 MS-DOS 6.0 was released August, 1993.